Dossier. Cine policíaco francés. Revista Dirigido. Germaine Cazeneuve (Jean Gabin) is an educator of delinquents and state prisoners, his job is to help them reform and adjust to a new life outside of prison. He pleads for leniency in the case of safe cracker Gino Strabliggi (Alain Delon) who is up for parole after 10 years inside, against their better judgement the parole board agrees to Cazeneuve's request on condition that he takes responsibility for Strabliggi. 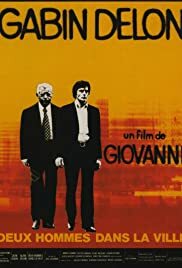 Gino, as an ex con, is forced by French law to take residence anywhere but in a city and so he settles with his young wife in the country, where fate turns against him, as first his wife is killed, then he is hounded by his former crime gang to return to his former lifestyle and also one of the arresting officers from his case years previously, the now chief inspector Goitreau is in charge of the area and has a grudge against him and becomes even more suspicious when he finds out Gino's new girlfriend Lucie is working in the local bank With the help of his now good friend Cazeuenve and his new girlfriend Lucie (Mimsy Farmer) he tries to battle his demons and fight against the troublesome cop. Jose Giovanni (born Joseph Damiani) is perhaps best known as a writer of some renown in France, in films like Melvilles Le Deuxième soufflé, and Classe tous risques (1960) his writings usually centering on crime, an area he knew only too well, as he was on death row in France from 1948-1956 before gaining a Presidential pardon. While inside he penned the script for Le Trou, French slang for prison literally meaning "The Hole", a script that would gain him one of his first steps into the film industry, when it was filmed by Jacques Becker, who turned out one of the best prison films ever made. Deux hommes dans la ville is a film that was obviously close to his heart as it doesn't reveal its true motives until the end, where we are treated to an emotional climax on death row, with the usual last minute wait on a pardon. The film itself is an excellent character study, made all the better by two fine performances by the Gabin and Delon. Gabin giving us a truly world weary performance, his voice-over at times heartbreaking, as he comes to terms with the injustices he encounters on a daily basis. Delon portrays the truly reformed character Gino, struggling against the injustice of a criminal and legal system that still lives in the dark ages with a deliciously watchable class. The film struggles at times, especially early on to keep cohesion, Giovanni seemingly trying to fit to many characters and too much plot into a short time span, its almost like this film should have had a running time of 4 hours and he struggled to leave out areas that were obviously dear to his heart. Still though it's a classy film, beautifully filmed and with a truly epic and emotive score by Philippe Sarde. Giallo queen Farmer is also pretty good and there a very charismatic cameo from Gerard Depardieu as a cocky young criminal, who's not that impressed by Gino's past glories.